Um…..so this happened. And yes, you may call it crazy. Maybe it is, maybe chocolate and lemon don’t go together, who am I to say? My husband certainly thought it was crazy. He ate the lemon meringue part separate from the brownie part and declared both amazing. Just not together. I thought this lemon meringue brownie pie mash-up was amazing. But then, we’ve established that I’m crazy. But you know what? The ultimate pi day called for the ultimate pie. I needed something new and different and crazy, and I needed to post it at 9:26 in the morning on Mar 14, 2015. Because I’m a math nerd and I kind of get a kick out of things like that. And yes, there is such a thing as a pie emergency. Sometimes you just need pie. The first time I ever thought of having chocolate and lemon together was a few years ago when my brother-in-law wanted a chocolate lemon birthday cake. Everyone kind of thought he was crazy, since that’s not really a thing. I thought he was a genius. But really, lemon is good, chocolate is good; therefore lemon with chocolate is good. That’s just math. Which is rather appropriate for this ultimate pi day. 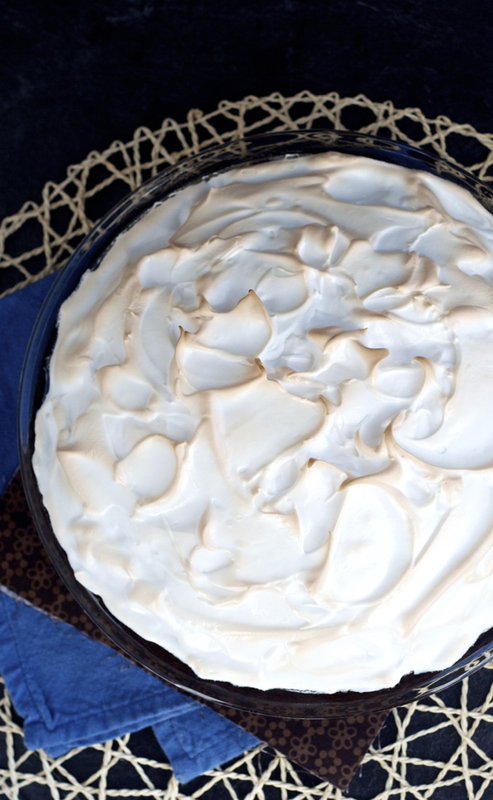 And if you’re not into math, well, you can still make this pie. It’s a lemon meringue brownie pie, crazy maybe, but awfully tasty. Trust me, the math doesn’t lie. Note: This pie takes a little time to assemble, but all of the steps are easy. There is some cooling and chilling time in between layers though, so it isn't a fast pie. But it's also not difficult so don't be intimidated by the long recipe! Also, wait until it's completely cooled to slice into it, or the lemon layer will be runny. If you wait until it's cooled, or even chill it in the refrigerator, the filling will set up. Make the brownie base first. Preheat the oven to 350 degrees F, and grease a 9 inch pie plate. In a microwave safe bowl, heat the chocolate at 50% power for 2-3 minutes, stirring every 30 seconds until it’s completely melted. Set aside to cool slightly. In a large bowl, whisk together the sugar, flour, cocoa powder, salt and baking powder. In a small bowl, whisk together the eggs, oil and vanilla. Add this to the dry ingredients and stir until just combined. Add the melted chocolate and stir to combine. Pour the brownie batter into the prepared pie plate and spread it out evenly. Bake for 25-30 minutes until it is just set. Do not overbake, or the brownie layer will be dry, as it needs to bake again later for 6 minutes to cook the meringue. Let it cool completely in the pie plate on a wire rack. Make the lemon filling next. In a medium saucepan, combine the water, sugar, cornstarch and salt and bring to a simmer over medium heat, whisking constantly. When the mixture starts to become translucent (about 4-5 minutes), add the egg yolks, one at a time and whisk to combine. Add the lemon juice, zest and butter and continue whisking until the mixture comes back to a high simmer and has thickened (1-2 minutes). Remove from the heat and allow to cool slightly (2-3 minutes) and then pour the filling onto the brownie base. Spread the filling over the center of the brownie base, leaving about an inch around the edges with no filling. Cover the pie with plastic wrap, directly on top of the filling, and refrigerate until completely chilled, 1-2 hours. Make the meringue. Preheat the oven to 400 degrees F. In a medium saucepan combine the sugar and water over medium-high heat. Bring to a full rolling boil and boil for 4 minutes, whisking constantly. Remove the syrup from the heat and set aside while beating the egg whites. Using a stand mixer with the whisk attachment, beat the egg whites with the cream of tartar and salt until soft peaks form. While the mixer is running, pour the hot sugar syrup in slowly, avoiding the beaters, and add the vanilla. Continue to beat the whites until the meringue has cooled and become very thick and shiny. Scoop the meringue on top of the chilled pie, making sure to bring it to the edges and cover the brownie base. Use a rubber spatula to make swirls and peaks all over the meringue. Bake for 6 minutes until the peaks are golden brown. Allow to cool in the pan on a wire rack at room temperature. The pie is best served the same day, store loosely covered with foil in the refrigerator for up to 3 days. Source: Brownie adapted from Deliciously Yum , filling and meringue slightly adapted from Cook’s Illustrated Baking Book . Um, this is AWESOME. I never would've dreamed up such a dessert. WOW, it's amazing. Whaaaat?! Mind. Blown. This is my favorite thing you've ever made, Stacey!! I'm speechless. Literally. 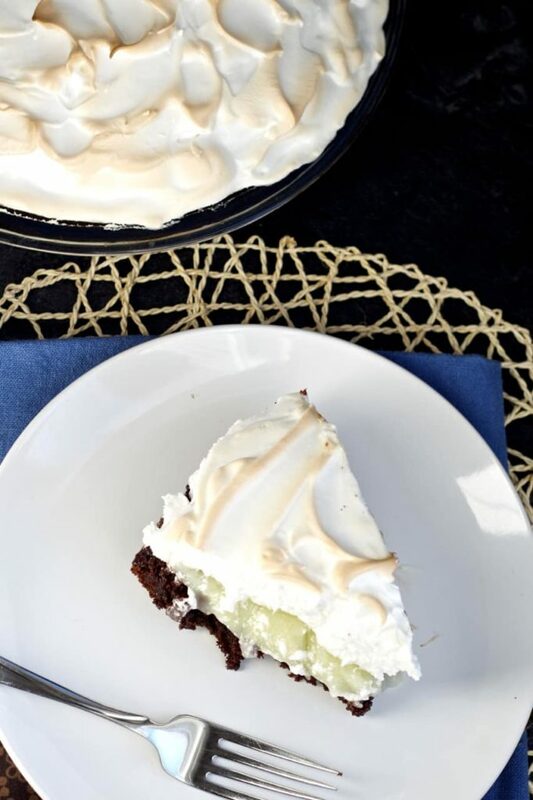 Brownie crust on a lemon meringue pie. !!!!!!! Pinned! Haha, well I took a page out of your book with the mash-up! At least I'm not the only one that thinks it's a good idea! :) Thanks Dorothy! This pie sounds fantastic, Stacey! 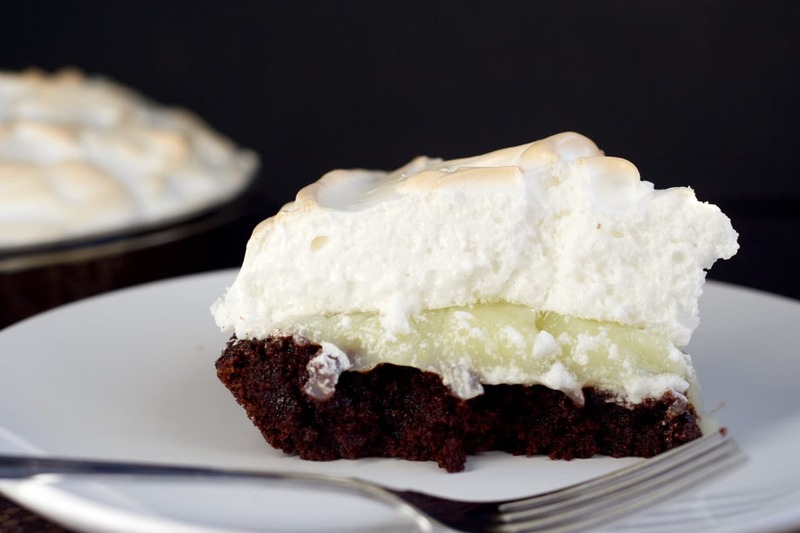 I love that you combined lemon meringue and brownies. So creative! I've tried coffee and lemon together and I love that combination. I've sure that a chocolate and lemon concoction isn't that different. This looks beautiful. I'm going to have to give it a try! Coffee and lemon? Really? That's never occurred to me, but I definitely need to try it! Thanks Erin! Ooo this is perfect! I mean who can resist brownie + pie! mmmmmmm!! Pinned. Right?! How can it be bad?! Thanks Manali! Desserts on Fridays are KEY! Also, anything cookies and cream have me totally freaking out. Lemon meringue pie + brownie??? This is definitely the ultimate pie for Pi day!! What an incredible mash-up! It looks amazing with all those layers! the first thing i said when i saw the first pic was "i bet that topping is hiding quite a stunning and delicious filling" and i was right. it looks so great both on the outside and on the inside when you slice into it!